Raise your hand if this sounds like you: You’ve been wanting to start your own website or blog for some time now, but don’t have any idea where to begin. The thought of dealing with domains, hosting (what the heck is that? ), and anything ultra-technical just overwhelms you. WordPress is a content management system that powers over 25% of the entire web. WordPress allows you to effortlessly manage your blog posts, images, videos, pages, menus, and every other aspect of your site, all from a central, easy-to-use dashboard. Why is WordPress so popular? Because you can do just about anything with it. WordPress gives you endless design flexibility, full control over your website, access to plugins that can greatly extend the functionality of your site, and so many other priceless features. Learn more on WordPress.org. If you’re new to WordPress, you may not know that there are actually two versions of WordPress. WordPress.org is also known as “self-hosted” WordPress, which means that you’ll need to sign up for web hosting with a hosting provider. 99% of the time when anyone talks about WordPress, they are talking about WordPress.org. WordPress.com is a free, limited hosted service owned by Automattic. WordPress.com places a lot of restrictions on users and doesn’t allow for things like themes and plugins, which are some of the best parts of WordPress! Our themes are designed exclusively for WordPress.org and will not work on WordPress.com, even if you have a paid account. A domain is your website’s URL (i.e. 17thavenuedesigns.com). Think of a domain like the license plate on your car. With it, you can be located on the web. A domain registrar is like the DMV of the web. A registrar will give you a “license” to use your domain for a certain period of time (one, two, or more years). What is hosting, and what is a hosting provider? Once you have a domain name, you need a place to park it on the web. Think of your hosting provider as your website’s “garage.” This is where your domain will be hosted and your website’s files stored. Some hosting providers also let you purchase domains right through them – so you can register your domain and get hosting at the same time, like we’ll show you below. So easy! Your first step is to find a reliable company that you would like to host your website. We love and recommend Bluehost. They have top-tier support, affordable prices, and your first domain is always free! 2. You’ll be taken to a page where you can select a Bluehost plan. We recommend the Prime plan — this plan includes Domain Privacy and Site Backup Pro, both of which we encourage you to have on your site. Domain Privacy keeps your contact information (like your home address) from being publicly displayed online. Site Backup Pro performs automatic backups for your site so you’re covered in case of data loss. 3. On the next page, type in the domain name you would like to use and choose a domain extension. We recommend a .com domain extension since it is the most common and recognizable, but .net will work in a pinch if your chosen domain isn’t available for .com. If you have an existing domain hosted elsewhere, you can type your domain in on this page. 4. Bluehost will check to make sure the domain name you’ve chosen is available. If it is, you’ll move on to the account information page. Enter your account details and payment information. 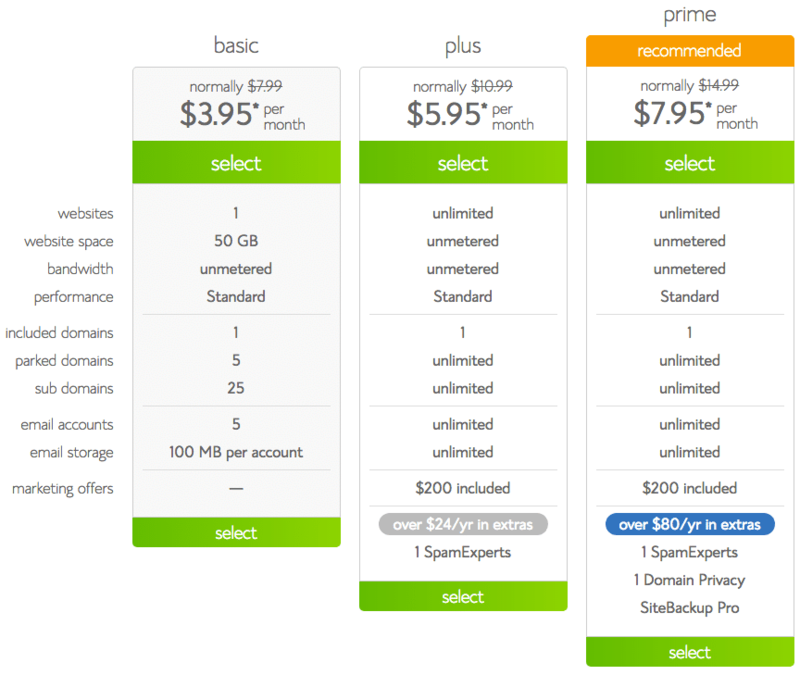 If you didn’t choose the Prime plan, we HIGHLY recommend that you add Domain Privacy to whichever plan you chose. 5. Once you have completed the signup process, you’ll be asked to create a password for your account. Then you’ll be ready to use your Bluehost hosting account & domain! Now that you have a domain and you’ve signed up for hosting, your site is going to look pretty empty. The next step of setting up your WordPress website is to install WordPress software on your domain. Bluehost makes this super simple. 1. Log into your Bluehost account. 2. After login you should be directed to the cPanel page. Scroll down and find the Website section. 3. Under Website, select Install WordPress. 4. On the next page, click Continue Installation. 5. Choose your domain from the drop-down list on the left. Leave “Directory” blank. You can uncheck both plugins, you won’t be needing them. Click Next. 6. Fill in your site title, admin username, admin email, and admin password. Be sure to use a STRONG password to help keep your site secure and protected from hacking. 7. Click Next. WordPress software will begin installing on your domain. It may take a couple minutes to fully install. Your login URL, username, and password will also be sent to you in an email from Bluehost. Here’s the fun part! It’s time to choose a theme that fits your brand and style. Our collection of WordPress Themes are designed to elevate your website, draw in your audience, and beautifully accentuate your content. Each theme was handcrafted with an emphasis on responsive design, gorgeous designer details, functional features, and endless flexibility. You’ll find a theme for every taste in our shop – ranging from modern and sleek to classic and feminine. Step Four: Set Up & Launch your site! Once you’ve purchased your dream WordPress theme, you’ll receive an email with a download link. Unzip the file and follow the detailed installation instrctions we provide to set up your theme on your website. Trustus when we say “detailed” – we will hold your hand through each and every step! If you need any help, we are always ready & happy to assist. Be sure to check out our Support Center, where you can find hundreds of WordPress tutorials, troubleshooting, and theme documentation. We also offer installation services if you’d like us to take care of setting up your theme on your site. Once your site looks absolutely perfect, it’s launch time, lady! Pop the champagne and celebrate!! Some of the links on this page are affiliate links. This means that we may receive a commission if you click on the link and decide to purchase. We only recommend companies that we’ve personally worked with and know and trust.